Index map showing the extent of the Rio Grande Rift and the Española Basin region of interest, New Mexico. The Española basin is located in the Rio Grande watershed in northern New Mexico and includes the state capitol of Santa Fe. Previous studies have defined the extent of the basin in a wide variety of ways, based on the inclusion or exclusion of specific areas and criteria dependent on the scope and focus of the study. To avoid restrictions on the focus of study, our basin outline is meant only to indicate a region of interest rather than represent a definition of the basin extent. The outline encompasses most of the areas defined from previous geologic studies and in some places incorporates recharge areas that might be of interest in regional ground water studies. The region includes the cities of Santa Fe, Española, and Los Alamos; Eldorado subdivision; the towns of Abiquiu and Las Trampas and surrounding communities; and portions or all of the Pueblo nations of San Juan, Santa Clara, San Ildefonso, Pojoaque, Nambe, Tesuque, Cochiti, and Santo Domingo. The Española basin is part of the Rio Grande rift, which is a general north-south alignment of large geologic basins extending from southern Colorado to Mexico. For the past 25 million years, the basins developed as the geologic landscape subsided irregularly in response to plate tectonic stresses pulling the continent apart. As the basins formed, they filled with large volumes of sediment washed in from the sides and eventually carried in by an ancient Rio Grande drainage system as well. Occasional volcanic eruptions within the rift extruded lava and ash on top of the sediments as deposition continued, such as the eruptions associated with volcanic rocks presently exposed in the Jemez Mountains in the Española basin. The extent of the Espanola Basin. 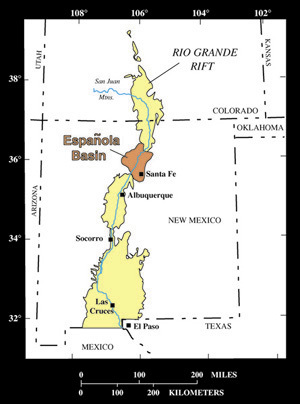 The sediments that fill the Española basin comprise an aquifer system that currently contains the primary source of water for most residents of the basin. These resources are limited and under stress due to continuing urban development and drought conditions. Managing the resources wisely involves a better understanding of regional ground-water flow, water quality, and water storage, which are fundamentally controlled by the geologic and hydrogeologic framework of the basin. Thus, improving the understanding of the basin framework through geologic, geophysical, and hydrologic studies is a critical step in developing wise and fair water management principles. The geologic framework includes parameters such as basin depth; sediment type and thickness; vertical and lateral extent of igneous and related rocks; location, geometry, and physical characteristics of faults and fractures; dips and folds of layers; and rock chemistry. The hydrogeologic framework includes parameters such as aquifer properties and ground water/surface water and rock/water interactions. Who has already studied it?